Princess pink, purple and blues will welcome your little Princess and her entire court of ladies faire. 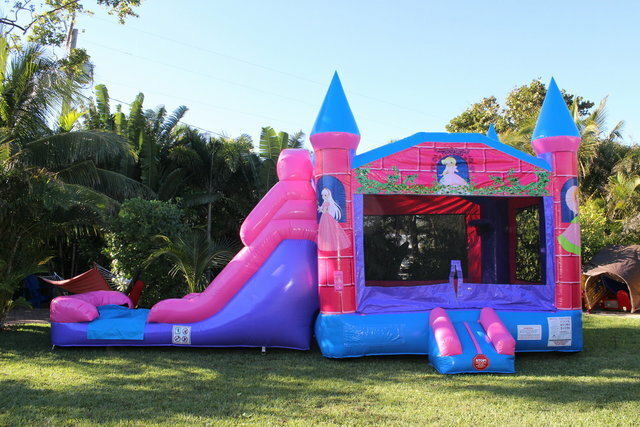 The Pink Princess Double Lane Bounce House Dry Como is in the shape of a priness's castle, with spires on the corner pillars. The inlfatable features vibrant pink and puple colors and colorful graphics at the entrance. The 3 foot ramp makes for easy entrance into the bounce house. The large netted vent windows to keep the castle cool and to allow parents to keep a watchful eye on activities inside. There is also an inflatable safety ramp at the entrance and a "No-Jump" net at the top of the slide to keep all your little guests safe. The large bounce area and the attached slide will provide hours of active fun at your next party or event. The slide can be used as a dry slide or a water slide. Take your party to the next level with a complete party package from Party Go Round. 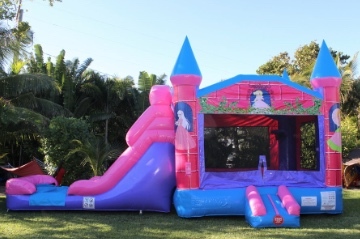 Save big when you bundle this Princess Combo Bounce House w/ one of our incredible fun games your choice of concession machine. Choose between Giant Connect 4, Giant Jenga, Bucket Ball, Kick & Score Fame Game or Strike 'Em Out Frame Game. Then pick which concession machine you'd like. You can choose from refreshing sno cones, sweet cotton candy or some delicious popcorn. We'll also provide 50 servings for the concession machine you choose as well.